Get ready for Thirds - the greatest fairy tale never told continues with a hilarious comedy of royal proportions in Shrek the Third. 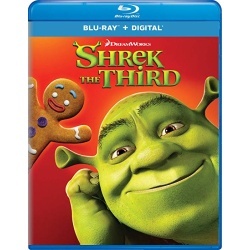 When his frog-in-law suddenly croaks, Shrek embarks on another whirlwind adventure with Donkey and Puss In Boots to find the rightful heir to the throne. Everyone's favorite cast of characters is back, along with a magical misguided Merlin, an awkward Arthur, a powerful posse of princesses, and a bundle of unexpected arrivals. Only Shrek can tell a tale where everyone lives happily ever laughter!